The height difference between the pair is over two feet. IT IS a good thing that opposites attract, otherwise Sultan Kosen might’ve had a hard time finding a woman of similar proportions to share his life with. 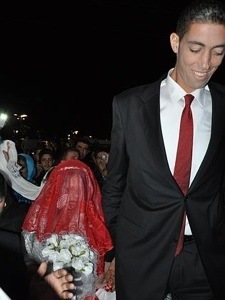 The world’s tallest man is 2.51 metres high, which is a good two feet and seven inches taller than his new bride, Merve Dibo. The Turkish farmer was married in a ceremony at the weekend, after previously almost giving up hope he’d ever find love, the Daily Mail reports. The Turkish farmer has married his lady love, Merve Dibo, from Syria. He’s one of only 10 people in recorded history to top the eight feet mark. And he also holds the current Guinness World Record for the largest feet and hands on the planet. Kosen’s gigantic wedding suit needed to be custom made, obviously. And his celebrity status in his home country meant the nuptials were a who’s who of Turkey. Kosen suffers from a rare disorder called pituitary gigantism, which causes his body to continually produce the growth hormone. His condition is believed to have been caused by a tumour in the pituitary gland. Doctors thought they had cured him in 2008 when they removed the tumour but he continued to grow by half an inch (1.27cm) a year. Now medics say he has finally stopped growing.